Born: 27 August 1882, Kilkenny, Ireland. Edward Henry Croghan, analytical chemist, was the eldest son of Dr Edward Henry Croghan (MD, died 1900) and his wife Marguerite Smyth. He attended school in Dublin, Ireland, then in Johannesburg, and from 1899 to 1900 at the South African College, Cape Town. He passed the matriculation examination of the University of the Cape of Good Hope in 1899, but obtained no further academic qualification at the time. From January 1901 to August 1902 he was an assistant to Professor P.D. Hahn* in the Department of Chemistry at the South African College. In February 1903 he was appointed assistant analytical chemist to Messrs H. Eckstein and Co. of Johannesburg. He was promoted to their chief analytical chemist in January 1906, but held that post only until the company closed their laboratory in September 1907. In 1910 he worked at the Chemical and Metallurgical Laboratory in Johannesburg and in 1922 at the dynamite factory of the Cape Explosives Works in Somerset West. By the end of 1903 Croghan was an associate of the Chemical, Metallurgical and Mining Society of South Africa and the next year was elected a member. In May 1904 he presented a paper before the society on "Analyses of some Witwatersrand soils". This paper, which was published in its Journal (Vol. 4, pp. 587-595), earned him the society's agricultural chemistry prize that year. His second contribution to the proceedings, "Notes on the estimation of caustic lime", was delivered in August 1907. 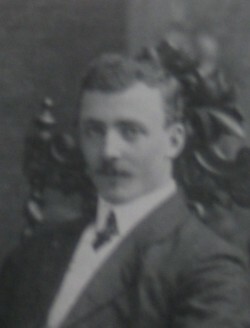 During 1908-1909 he served as a member of the society's council. Later papers by him dealt with "Making of silver amalgam" (Journal, 1909-1910, Vol. 10, pp. 42-) and "Experiments on the precipitation of gold from cyanide solutions by carbon in lime" (Ibidl, pp. 391-). Croghan was a member also of the South African Association for the Advancement of Science and at the joint meeting of this association with its British counterpart in South Africa in 1905 presented a paper on "A fuel of the Midland districts of South Africa", in which he pointed out that sheep dung, and the ash remaining after it is burned as fuel, are of great economic value to fertilize clayey soils and as a source of potassium carbonate for industrial purposes. The paper was included in the Addresses and papers... (Vol. 1, pp. 237-246) published after the meeting. Edward Henry Croghan, residing in Cape Town, became a member of the South African Association of Analytical Chemists (from 1921 the South African Chemical Institute) in 1919 and served on its council during 1930-1934. By 1922 he had been awarded the degree Master of Arts (MA) by the University of Cambridge and by 1934 was a Fellow of the Institute of Chemistry. In 1926 he served on Cape Town's streets and drainage committee. During 1922-1941 he reported on sanitation and sewage disposal and published a paper on 'The activated sludge process of sewage purification in South Africa' (Journal of the Institute of Municipal and County Engineers, 1931). Edward Henry Croghan, MA (Cambridge), presumably the same person, was still listed as a member of the South African Chemical Institute in 1958 (when he was 76 years old), having rejoined in 1945). Croghan married Alice Mary Lancaster Lawry in Johannesburg on 19 May 1909. Another Edward Henry Croghan, who may have been their son, was born in 1911. Chemical, Metallurgical and Mining Society of South Africa. Proceedings, 1902-1903, Vol. 3, list of members; Journal, 1904/5, Vol. 5, Members; 1909-1910, Vol. 10, papers by Croghan. Google scholar. http://scholar.google.co.za Publications by E.H. Croghan. Identity Number, at http://www.identitynumber.org/marriage-lookup-surname-results1.php?surname=LAWRIE as on 2016-5-11. National Automated Archival Information Retrieval System (NAAIRS). http://www.national.archives.gov.za/naairs.htm Documents relating to Edward Henry Croghan / EH Croghan. South African Chemical Institute. Proceedings and list of members, 1921-1922 and 1933-1934; List of members, 1958. University of the Cape of Good Hope. Calendar, 1903/4, 1906/7.